Horses are welcome for training for one session, to one week, to several months. We don't have a set training program, because what works well with one horse, may not work with another. Each horse is unique with his/her own set of strengths and weaknesses. However, our goal is to produce a happy, forward, and responsive partner that YOU can ride and enjoy. The best trained horse is one that responds to you, not just a professional rider. By training and rewarding our horses to respond correctly to the leg, seat, and voice, your horse will learn to be more a confident and willing partner. We work with a variety of horses ranging from babies to those who are needing to perfect the higher level movements in dressage. To find out if Spring Run Farm is the right choice for your horse's training, please call Susan Harris at 502-228-3456 or 502-643- 2364. The Spring Run Eventing Program is also run by Susan Harris. 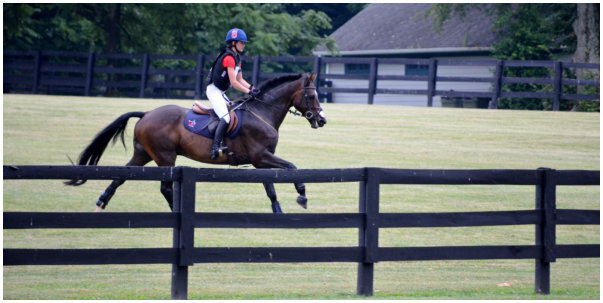 Susan is a certified Instructor through Level 3 -Intermediate 2 Star with USEA. She hosts at least 2 eventing clinics at Spring Run Farm each year!